Why Bother!! If we take a look at the majority of aircraft from the early 1940’s onwards, especially military subjects, they all have one thing in common; they all have a retractable landing gear. To accommodate this, large recesses are required in the underside of the aircraft to accept the retracted landing gear, and for obvious aerodynamic reasons, these recesses require covers that open and close, in order to enclose the gear and clean up the airframe once the gear has retracted. Many an article has been written in the full size aviation press where gear doors have been mentioned. The effects of missing doors, (from failure or battle damage) or just a malfunctioning hanging door can be quite noticeable, for instance, pulling to one side, minor buffeting, decrease in top speed, etc, etc…My first question is this, Why should our scale models be any different? Answer, They’re not! Gear doors serve the simple purpose of improving the aerodynamic efficiency of our aircraft once the gear is away. In addition to this, we have the realism factor, if the full size had them, then so should our models. Small operative features such as these add great character to a model, and are not the fiddly nightmare that many modellers view them to be. With a little extra thought and careful attention, fully operative gear doors can be a reliable and rewarding feature. This article will be basing on WW2 fighters (namely P-47 and P-51) Both subjects have leg doors covering the oleo and upper section of wheel, and a secondary ‘Clamshell’ door that is actuated separately to cover the remaining lower section of wheel. 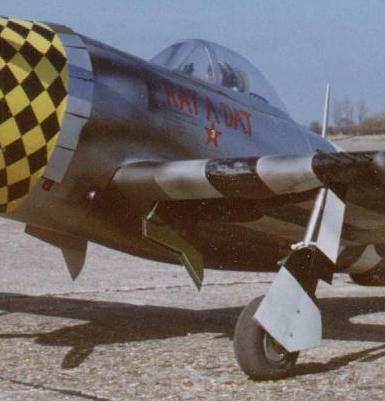 On the full size P-51, when at rest, the doors droop down under their own weight, only retracting to their normal closed position when hydraulic pressure rises upon engine start. I’m not really going to mention the leg doors too much here, as these are a little easier to model, and don’t require a lot of ‘This is how‘. The motive force for this door is often the leg itself, so if we try to copy the full size hinging and linkage points, there won’t be too many problems to overcome. Even so, the leg door used many of the same methods and materials as the inner door, so if you’ve not done working doors at all in the past, keep reading! The first problem to overcome is how are we going to operate these doors simply but reliably. We don’t want a highly complex (no matter how clever) system, as the more complex the method, the more prone to failure it’ll be. We don’t want doors flapping in the prop wash because they are not held securely enough, just the same as we don’t want doors opening and closing in the wrong sequence, so preventing correct operation of the gear itself. A P-51 with the legs trying to retract onto closed doors just doesn’t do it ! Over the last few years, I’ve tried various mechanical methods of operating the doors, using the retracting leg/wheel to pull the door closed and push it open again on the way down. This method took a fair bit of fiddling around, and I was never 100% happy with the end result, even resorting to throwing the doors away on one occasion. Having no means of locking the door in the open position, they had a habit of flapping as soon as the engine was started, and therefore fowling on the wheel as it tried to retract past it. The method I have used on the last couple of models is to drive the doors with miniature air rams, tapping off the main gear supply for air. Using this method means the doors are held solid by the ram in both the up and down position, hence, no more flapping. The heart of this system is the retract spool valve. Ultra Precision of Ontario Canada manufactures a great range of custom spool valves for a wide variety of different applications. Two of which allow the modeller to sequence the operation of the landing gear with the opening and closing of inner wheel well doors. The two valves in question look identical, but vary slightly in operation. The U.P.2 is ideal for the P-51, where upon selecting gear down, the inner doors open, the gear then extends, and the inner doors close again. The U.P.3 (as used in the P-47 shown), operates exactly the same, but doesn’t close the inner doors once the gear has extended, they stay open. These valves contain small needle valves on the up and down sides of all functions, allowing you to adjust the operating speed of the legs and doors. Operating speeds for legs can be varied between 3 and 10 second (nice and slow), and 0.5 and 3 second on the doors. In order for the doors to open and close fully, the geometry of all the pivot points has to be correct. You can’t do this simply by trial and error; you’ll be there for hours. The simplest and most reliable method is to go get the paper, pencil and compasses out, and draw it out by hand (accurately!). First off, you must accurately draw a cross section through your undercarriage well. Mark the position of the door pivot point, and draw the door on in its open and closed position. You’ll have to refer to your documentation here, as not all systems opened through a full 90 degrees. Make sure you get it right for the model your building, it’s the little things that if wrong can make your model look decidedly strange. Next job, draw on the door actuating horn and the pivot point of the ram on the horn. It is the position of this horn/pivot that will ultimately get the doors operating correctly, a good starting point would be to have the horn pivot 15mm inboard of the door pivot, and around 10mm off the surface of the door itself. Mark the horn/pivot on the open and closed-door position, making sure they’re both identical though! The next stage is to measure the exact length of the air ram from the centres of the pivot points at either end. Most rams usually have some form of bracket at the fixed end, and the plunger is threaded to accept a small ball joint. Carefully measure the length in it’s closed position, then add on the amount of travel to give you the open length. Back to the drawing, with a pair of compasses, set the distance to the closed length and draw an arc with the point of the compass on the door horn pivot in it’s closed position. Next, open the compass out to the open length and draw another arc, but with the point on the door horn pivot in its open position. Wherever the two arcs cross is the pivot point for the fixed end of the air ram. As happened a few times with me the first few times I tried it, the crossing arcs ended up outside the wing skin, or in such a shallow position, the ram wouldn’t open the door. As I mentioned earlier, the remedy for this is to play around with the position of the door horn and it’s pivot point. You’ll be surprised how a movement of only a few millimetres in either direction can make all the difference. The result we are looking for, particularly with a model such as the P-47 where the wheel wells are spread well apart, is for the ram to be contained completely within the wheel well, with the direction of ram movement to be no less than ¼” outboard of the door pivot itself (see drawing). Any less than this, and the angles are getting pretty tight which will prevent the ram from easily moving the door. 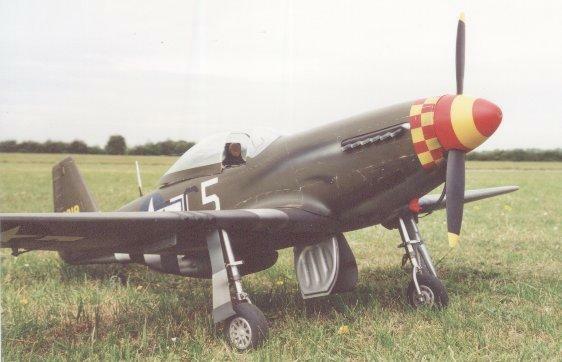 If you are modelling a type such as the P-51 or later model FW 190’s (Ta 152) where the wheel wells almost touch in the centre, your task is a little easier. You will be able to mount the rams almost vertical in the wing, with the fixed pivot protruding through the top skin of the wing, but concealed within the fuselage. Right, we know where everything has to go, but the construction has to be equally as accurate if you are to have successfully operating doors. The first constructional decision is to decide upon an appropriate material for the doors themselves. I have tried several different materials over the years, some with better results than others. If your subject has doors with only a single curvature, you have a choice of around 3 materials. If your subject has highly shaped doors, such as the Bearcat, your only real option is to mould them from fibreglass. Back to the simpler doors of the P-47, your first choice would be 1/32” plywood. Easy to work with, but needs a reasonable amount of surface preparation before they are ready for detailing and installation. The other downside to thin ply in this application is that it is easily damaged. The doors have a pretty hard life, they get used at least twice a flight, and get a real battering if the dreaded belly landing situation occurs, or a leg collapses. Your second choice is thin aluminium sheet. Again, easy to work with, easily formed to the curved profile of the wing, but in my experience, not very durable. The aluminium is very soft at this thickness, so scratches and bends very easily, even a little scrape getting the wing from the car can catch an edge, bending and damaging the door. The best material I have found is a thin fibreglass sheet called G –10. This material is only around 1/64” thick, very flexible, but incredibly tough. Polyply, a BVM product would do a similar job, and is available in various different thicknesses. Fabricating the doors is straight forward enough, but you must decide whether you want your doors to be exactly the same size as the well, so requiring a series of small door stop blocks positioned around the inner lip of the well to stop the door flush with the wing surface, or, to make the door around 1mm larger all the way round so the door sits on top of the wing surface. This method may not be 100% accurate, but is a lot less fiddly and is the method I used on the P-47. With the doors all closed up, the 1/64” thickness of the G-10 is not really noticeable, especially when you have invasion stripes and weathering to disguise it. Hinging of the doors is done simply with conventional pined control surface hinges. The one thing I will say is don’t glue the hinges to the wing and the door. Why? If the door or hinge does sustain damage and needs removing, gluing the hinge will make your job rather difficult. I have always attached the hinges to the door using small M2 or 12/14BA nuts and bolts. Most hinges have glue-keying holes moulded in, so why not use them! To attach the hinge to the wing, epoxy some snake inner into the balsa wheel well wall, and screw the hinge to these using small self-tapers. This method will allow a complete disassembly to be carried out if required. Perhaps the most critical area is the door horn and pivot. I have found it a good idea to make this detachable from the door too; modifying a conventional small plastic control horn is ideal for this part. Just make sure you check your positioning measurements 2/3 times before you start drilling holes etc. With the critical work on the doors complete, the last job is to position the fixed pivot for the air ram. Again, check and recheck your dimensions before you do any drilling. To mount the ram, I use the same method as for the doors. Sink a length of snake inner into the wheel well wall, leaving enough protruding so that when the ram is tightened down onto it, the ram body doesn’t fowl the well wall. The type of screw used for fixing is also important. I wouldn’t recommend a self taper threaded all the way down, the ram has to pivot a little in it’s mounting, a threaded screw will end up wearing away at the mounting hole. The best screws are the servo mount types that have a ¼” non-threaded section at the top, nice and smooth, no wear problems. The only time people will see the gear doors is when the model is on the ground with the doors open, all the more reason to put a little effort into detailing the inner surface to add that finishing touch. Very few aircraft had single skinned doors; most had some thickness to them or a simple stiffening structure on the inner surface. This detail is simple to add from blue foam covered in paper, or balsa with several coats of dope to seal prior to painting as used on the P-47. For the simple stiffening structures, plastic ‘I’ and ‘T’ beam can be ZAPped in place to give a simple but realistic appearance. This technique was utilized on the upper leg doors on the P-47.